Raizlabs is premium iOS, Android, & web app development agency based in Boston and San Francisco. Raizlabs has built award-winning apps for startups and big brands like Six Flags, AAA, L.L. Bean, Runkeeper, Rue La La, and more. 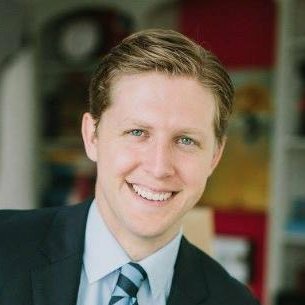 When Ben, Managing Director at Raizlabs, first reached out to me, he was unsatisfied with their previous ad campaign implementation and results, and was looking to leverage AdWords for more effective lead generation. The biggest challenge we were facing was our conversion goal, which was to get people to submit a form indicating their interest in hiring Raizlabs to build a custom application for them. Given that this is an extremely high-friction conversion, we knew from the start that we'd be seeing fairly low conversion volume, but we also knew that Raizlab's premium pricing meant that even one successful conversion would more than justify our ad spend with massive ROI. Raizlabs had been working with an ad agency previously, which had set up numerous AdWords campaigns on their behalf, but hadn't driven a single conversion. Still, I was able to review the campaigns they had run, in order to gather some initial insight into what keywords and ad copy might work well, relying mostly on click metrics to gauge performance. Initially, I had chosen to limit our service type keyword campaigns to target only the Boston and San Francisco areas, worried that bids and competition would be too high for these popular keywords (ex: "web app development") nationwide. However, we found that restricting our ads to these regions resulted in very low search volume, so we switched to targeting across the US, and started seeing much better results after this. Over the course of 2.5 months, we were able to drive 17 conversions from our new AdWords campaigns, a number far beyond what I had expected given the high-friction nature of our conversion goal! The Raizlabs team was excited to finally see new leads coming in from their investment in ads, and mentioned that a handful looked promising for conversion into high-paying clients. This ad generated 3 out of 5 conversions in the Brand Name campaign. This ad generated 4 out of 4 conversions in the Web Dev campaign. We also saw a 78% increase in click-through rate and a 30% improvement in average position, compared to the previous 2.5 months. 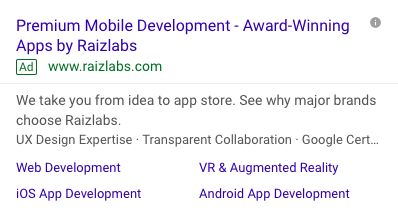 Through careful selection of keywords and keyword match types, strong ad copy, and continuous campaign optimization, we were able to drastically improve results from the Raizlabs AdWords account.